Worcestershire-based Jutexpo has helped Selfridges to become the first retailer in the world to supply customers with garment covers made from recycled plastic bottles. The covers have been supplied by Jutexpo, the world’s leading eco-friendly reusable bag company, and have been made using its HALT™ process to recycle plastic bottles into fabric. The garment covers, given to customers as a complimentary gift with items such as high-end suits, dresses and coats, are available in small, medium and large and each one is made using seven, eight and 12 plastic bottles respectively. 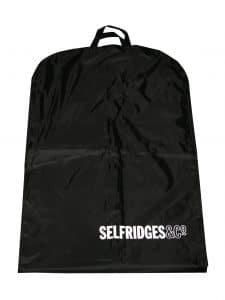 They have been rolled out in-store since the beginning of January and are now available in all Selfridges stores. It is anticipated that the first six months of garment covers will result in more than 222,000 plastic bottles being recycled from post-consumer waste. The Jutexpo covers are made from a fabric using 100% recycled plastic bottles and are the first to have the integrity of certification to the Global Recycled Standard (GRS). The HALT™ process turns the bottles into a durable and practical fabric called rPet, short for recycled polyethylene terephthalate, which is strong, durable and can be wiped clean. Robbie McGregor, Director of Jutexpo, based at Lauriston Business and Technology Park, Salford Priors, said: “As far as we are aware, this is the first time in the world that post-consumer plastic bottles have been used to create garment covers, reducing plastic waste and giving plastic bottles another useful purpose rather than ending up in landfill, incineration and uncontrollable waste streams. Market-leading reusable bag supplier Jutexpo was formed by father and son Barrie and Sam Turner after they spotted a gap in the market for reusable bags made out of Jute to minimise plastic bag usage. Jutexpo have ethically-produced 80 million reusable bags since the company was formed in 2002. Jutexpo operates to the Jutexpo Standard, which is a set of the 10 key elements which it considers to be the minimum when it comes to ethical and technical standards, awards and credentials.